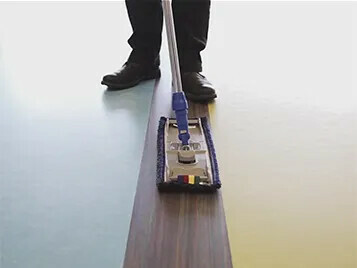 Our linoleum floors are easy to clean and maintain thanks to their durable Topshield2 finish. Marmoleum with Topshield2 is the only resilient flooring with an occupancy-ready finish. This means that at the time of installation, cleaning with a neutral pH cleaning solution is all that is necessary. The Topshield2 finish also provides exceptional performance against soiling, staining, scratching, and scuffing. Topshield2 has been designed to create a Marmoleum that meets the demands of everyday use and is even more resistant to dirt pick-up, less prone to wear and has improved resistance to scratches and stains, and thus creating a floor that demonstrates a lasting performance over time.